Shion 2.0b10 is now available. This release adds (beta) support for INSTEON thermostat devices as well as “Shion Remote” mode. I’ve also included a variety of bug fixes and UI tweaks that should provide a more enjoyable experience. 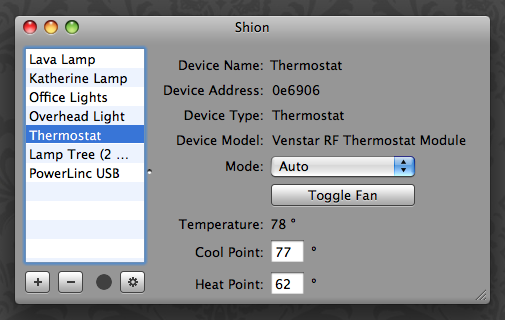 This release of Shion includes suppport for INSTEON-enabled thermostats. I’ve been testing with the Venstar units and the system is largely working. There are still a few bugs in how the thermostat reports information back to Shion, but overall, the code’s mature enough that I’m ready for your feedback about how well it works for you. 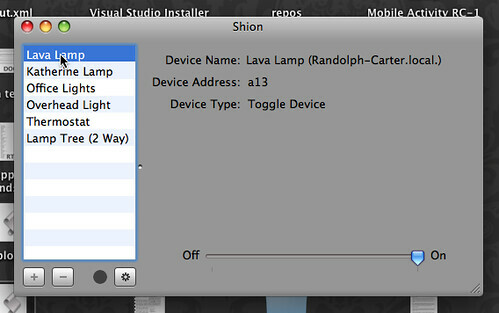 This release adds the ability for you to share your local Shion devices with other Shion clients on your network. To share a device, click the appropriate checkbox (as shown above). 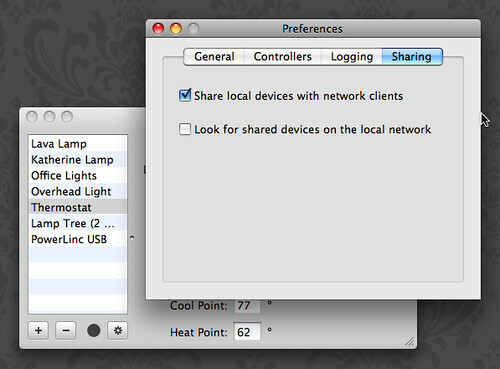 To set up a client to use shared devices, click the other checkbox on an instance of Shion running on another Mac on your network. None of the client machines need to have INSTEON or X10 hardware. When you are using a shared device, the display pane will identify which host is providing the device services. You can control the device as if it were locally connected. This includes creating and using snapshots. I’ve been testing this mode over the past week and remote control seems to work quite well. However, this is fresh new code, so there will probably be a handful of issues to uncover. Please report them using the issue tracker found in the Shion menu. I’m still working on the semantics of the remote devices in preparation for the iPhone application, so expect to see related features make an appearance (remote events, remote client management, etc.) in the next couple of releases. Again, there’s more work to be done on this feature, but I wanted to start getting feedback from users. This release is unrestricted for three or fewer devices. If you have more devices, e-mail me and I’ll be happy to send you a complimentary beta tester’s license, which will work for future non-beta releases as well.